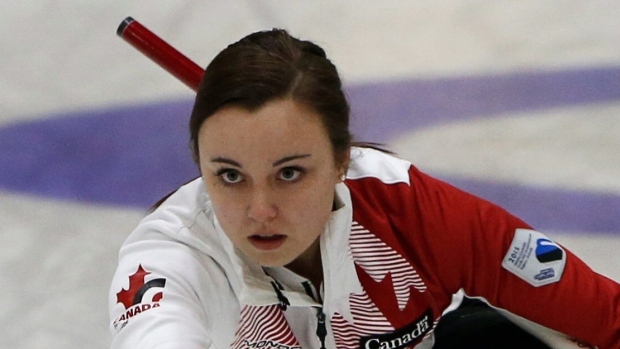 Two-time defending world junior curling champion Kelsey Rocque has a new team. Rocque, 20, will join Laura Crocker and her new rink for the 2015-16 season after their previous skip, Chelsea Carey, announced she would be leaving the Alberta team earlier this week. The foursome made the announcement on their official Facebook page Saturday. Crocker and Rocque will decide who will call the game and throw skip stones at season's end. Taylor McDonald and Jen Gates will remain at their familiar positions of second and lead. “I’m extremely excited to have an opportunity to play with Laura, Taylor and Jen,” said Rocque. “I know that we’ll be working hard on and off the ice as we work toward the goal of representing Canada internationally." Crocker, 24, says the team's ultimate goal will be qualifying for the 2018 Olympics in South Korea. Rocque recently won the world curling juniors in Estonia. She also won last year in Switzerland with McDonald as her second.